A native of Osaka, Japan, Aki Nishiguchi began studying classical piano at the age of five and picked up the saxophone at twelve. After performing regularly in Osaka for several years, Nishiguchi decided to pursue his musical studies overseas. In 2004, he was accepted into the prestigious Berklee College of Music on scholarship where he studied with legendary musicians and educators Frank Tiberi, George Garzone, Joe Lovano and Hal Crook. "PINGO" featuring Daiki Yasukagawa on bass, Hakuei Kim on Piano and Ko Omura on Drums in 2012. In 2016, Nishiguchi received 1st place at the Detroit Jazz Festival Competition in Yokohama. In 2016, His own group performed at DETROIT INTERNATIONAL JAZZ FESTIVAL in the U.S.A where their performance and repertoire were highly acclaimed by both the audience and the critics. Nishiguchi currently resides in Tokyo, Japan where he performs both as a sideman and leader. 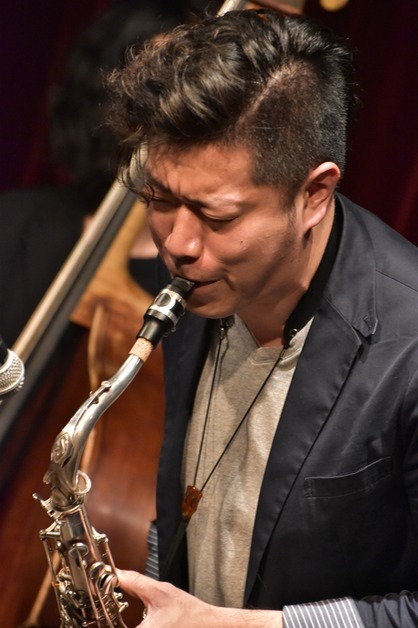 Some of the notables that Nishiguchi has played with internationally include Ron Carter, Takuya Kuroda, Michel Reis, Billy Drummond, Kiyashi Kitagawa, Uri Gurvich, Leo Genovese, Bob Mintzer, Terumasa Hino, Teriver Chang, Aaron Choulai.